Gothic architecture originated in Europe back in the 1100s and flourished ‘til the 1500s. If you see really old churches from that era, you’ll notice “flying buttresses,” pointed arches, and stained glass windows. Indeed, the Gothic “look” is evident today on churches even built in the 1800s and early 1900s in America. European people who came to America and wanted to copy what they grew up with in places like Italy and France here in cities like New York, Boston, and Philadelphia ended up building Gothic cathedrals in major cities. 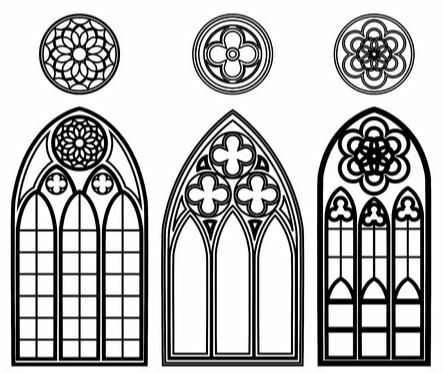 At the heart of Gothic architecture are giant and elaborate stained glass windows, colorfully and artfully depicting Biblical scenes for all to see. Glass craftsmen took spiritual and religious ideology and utilized windows to tell stories to the people who would see them. Not only that, but the actual stained glass would liven up the interior of gigantic churches with colorful, bright light and spectacle. By adding metallic salts and oxides, craftsmen gave the glass an almost jewel-like, glowing quality, which fit so well with the ideas of awe and mystery associated with God. Giant colorful, artistic windows letting in lots of light was/is in sharp contrast to Romanesque architecture, which was/is known for giant walls but tiny windows. In the old days, most people were illiterate. They could hear what the priest said, or they could look at the church windows and see illustrations of Biblical scenes and/or stories of saints. Sometimes a narrative would continue from window to window, so people could walk from one to another to see stories unfolding before their eyes. This lead to better understanding among the worshippers as to who/what they were worshipping. Finally, back in the old days there were patrons. Today we’d call them sponsors. These were the rich folks in town who would give money to certain causes and needs in the community. Wealthy patrons often used their excess money to fund the creation of gorgeous stained glass windows, and then their likeness would be depicted somewhere on or near a panel of the window in acknowledgement of their contribution. Much like people pay money to have their name on a brick for a brick walkway today, back then people would pay to have themselves immortalized in stained glass for all to see… and admire. If you need stained glass windows restored, contact Cumberland Stained Glass today.